With STS-135/Atlantis now officially extended by one day, the STS-135/Atlantis crew and the ISS crew are pressing forward with the immediate days of the mission as written by the pre-launch timeline. To that end, ISS crewmembers Mike Fossum and Ron Garan worked through the only EVA (spacewalk) of the docked portion of the Atlantis’s mission, which concluded successfully after 6 hours and 31 minutes. Chris Ferguson, Doug Hurley, Rex Walheim, and Sandy Magnus have begun the 5th flight day of their STS-135 mission to the International Space Station. Waking up at 0256 EDT, the STS-135 flight crew joined their six ISS counterparts in final preparations for the only EVA (Extra Vehicular Activity) – spacewalk – of the docked Atlantis mission. However, this EVA is different than any other performed during the docked portion of a Space Shuttle mission to the ISS. This EVA will not be performed by any Shuttle crewmembers, ISS crewmembers Mike Fossum (EV-1) and Ron Garan (EV-2) will perform the spacewalk. To accomplish this, final EVA preparations began with In-Suit Light Exercise (ISLE) preparations by Fossum and Garan – with assistance of two other crewmembers. 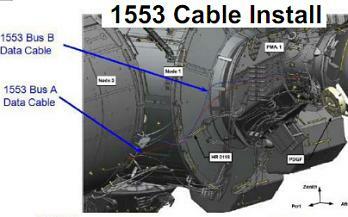 The ISLE procedure was first tested during EVA-3 of the previous STS-134/Endeavour mission this past May. After these preparations were complete, the spacewalking prep team began purging the two EMUs (Extravehicular Mobility Units) while STS-135/ISS crewmembers began transfer operations of equipment from the newly-mounted MPLM Raffaello to the ISS. Approximately 15 minutes after EMU purge, Fossum and Garan began the ISLE to prepare their body’s for the EVA. The ISLE replaces the traditional night-before campout in the Quest Airlock of the ISS – a procedure that also prepared spacewalking crews for their excursions. Around two hours of ISLE prebreathe activities, Fossum and Garan transferred to the crew lock portion of the Quest, where crew lock depressurization followed. Following depressurization, Fossum and Garan officially took their EMUs to battery power – an event which officially began the EVA slight later than originally scheduled. 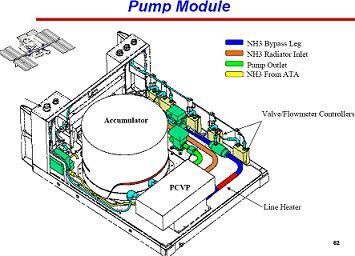 After egressing the Quest Airlock, Garan and Fossum spent the first hour of the EVA undertaking setup operations for their first task: Pump Module (PM) transfer from its storage location on the ISS to its return to Earth position in Atlantis’s Payload Bay (PLB). 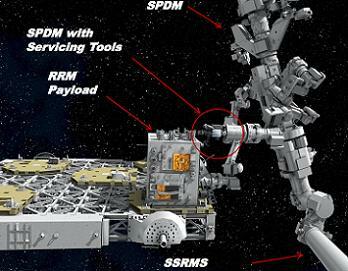 For Garan, this involved translating over the SSRMS (Space Station Remote Manipulator System, or robot arm) and setting it up a foot restraint on one end of the arm. For Fossum, setup activities included installation of COLTS. Then, about an hour after stepping outside the ISS, both Garan and Fossum began a half-hour procedure to remove the PM FRAM from External Stowage Platform -2. After this was accomplished, Ron Garan – on the end of the SSRMS – grabbed ahold of the PM while Fossum made the final release of the FRAM. Garan then maintained his grip on the PM and maneuvered on the end of the SSRMS from the ISS into the aft end of Atlantis’s PLB. Fossum translated down to and into the PLB on his own. Once Garan and Fossum were in position, they mounted the PM FRAM onto the LMC (Lightweight Multipurpose Support Structure Carrier) in the aft end of the PLB. The transfer and berthing of the PM took approximately 1hr. 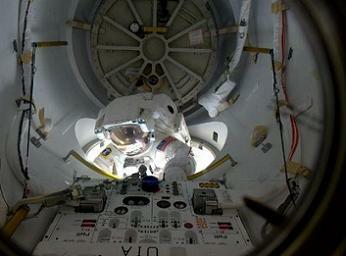 Once that task was accomplished, Garan was maneuvered to the top side of the LMC. Fossum also moved to this location. 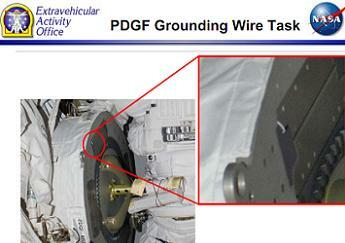 Fossum then detached the Robotics Refueling Mission (RRM) payload while Garan grabbed ahold of it. After its removal from the LMC, Garan then moved back to the ISS toward the Enhanced ORU (Orbital Replacement Unit) Temp Platform (ETOP). Both Fossum and Garan attached the RRM to the ETOP. This operation was scheduled to take Garan and Fossum 3hrs 45mins into the EVA, as proved to be the case as the duo matched the planned timeline almost by the minute. Garan then dismounted from the SSRMS and Fossum moved in to “clean up” the arm – which involved removing the foot restraint at its end. While Fossum carried out the task, Garan moved on to retrieve MISSE-8 (Materials on ISS Experiment -8) and installed it onto Express Logistics Carrier -2 (ELC-2). MISSE-8 is the Optical Reflector Materials Experiment Ram/Wake (ORMatE-III R/W). This operation took 1 hour 15minutes. Around 45mintes of SSRMS cleanup, Mike Fossum moveed on to start the first of several “get ahead” tasks. After his work on MISSE-8, Garan also began performing “get ahead” tasks. In order, the Program Approved “get ahead” tasks for this EVA were: PMA-3 (Pressurized Mating Adaptor 3) thermal cover installation, and the FGB (Function Cargo Block) PDGF (Power Data Grapple Fixture) 1553 cable installation. Also included were the FGB PDGF groundwire reconfiguration; Port CETA (Crew Equipment Translation Aid) cart reconfiguration; SSRMS end-B elbow CLPA (Camera/Light/Pan tilt Assembly) replacement; S1 FHRC P-clamp removal; and Gap spanner installation. While not all of these “get ahead” tasks had to be performed, the trouble-free spacewalk allowed the duo to finish the last even EVA during a shuttle mission in style, with no outstanding task. Approximately 45 minutes before the end of the EVA, Fossum and Garan began EVA clean-up operations before translating back to the Quest Airlock. The EVA ended after 6hours and 31minutes. (Images: Via L2 content and NASA.gov. Further articles on STS-135 will be produced during and after her mission, driven by L2′s STS-135 Special Section which is following the mission at MMT/MER level, surrounded by a wealth of FRR/PRCB/MER/MMT and SSP documentation/pressentations, videos, images and more.